IPv6 addresses and headers take up more space in the data packet than IPv4 addresses and headers do. Because of this some users are not able to connect to the VPN at all, and others can connect but can't download files, read email, or do other things that use large data payloads in their data packets. Adjusting the packet MTU to a lower value will make sure that there is enough space in the packet for the larger IPv6 headers. This only affects customers that connect over IPv6. Cisco's AnyConnect software will always use IPv4 if it is available, so this will mostly affect customers using openconnect, or customers that only have IPv6 (which is rare). The default MTU for wireless and Ethernet is 1500 bytes. 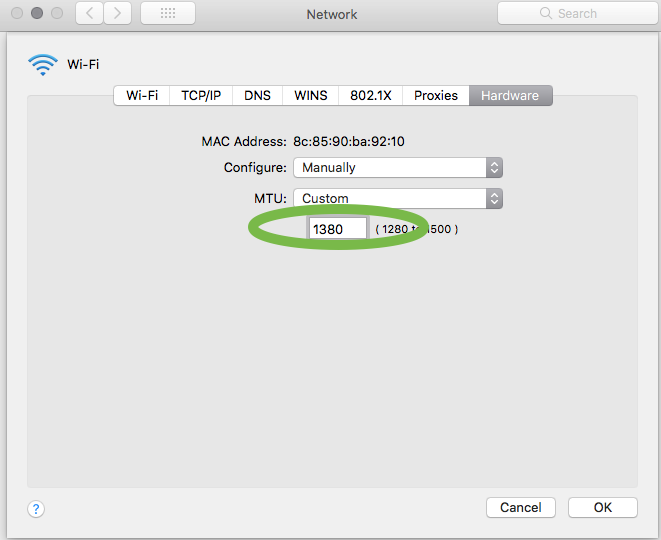 When using IPv6, especially if it is being tunneled, you'll need to set it down to between 1380 and 1450 depending on the your setup. How can you tell if this is the problem? 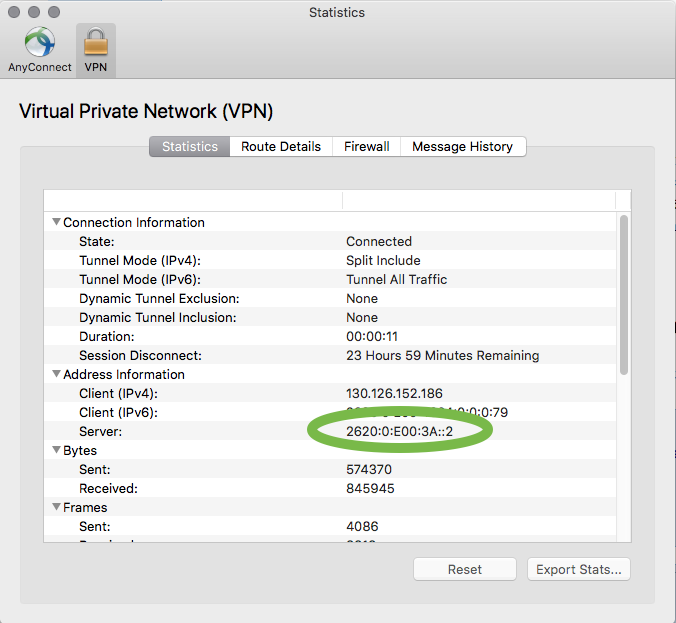 If you can't connect at all and your client just times out trying to connect (and is using IPv6 to get to the VPN*), then first check to see if you can ping6 the vpn (unix/Mac OS command is "ping6 vpn.cites.illinois.edu"). If that doesn't work, this is not the problem. If ping6 worked, then see if you can load the website over IPv6. https://vpn4g-1.gw.illinois.edu (or any of the VPNs). If it loads, this probably isn't the problem. If it loads, and the VPN connects, but then some things don't work, it might be the problem. If ping6 worked, but loading the website did not work, then there is a good chance this is your problem. Please try changing your MTU setting and see if that fixes the issue. If you think this is the problem you are having, then you need to set your MTU size down to at lest 1450, possibly as low as 1380 to make everything work. lick on the interface being used for their network connection, if it is not already selected. Click on the "Hardware" tab. Change the "Configure:" drop down to Manually. Change the "MTU:" drop down to Custom. Type in 1380, click Okay, and then click Apply. Follow the instructions from this website: https://support.zen.co.uk/kb/Knowledgebase/Changing-the-MTU-size-in-Windows-Vista-7-or-8 but replace "ipv4" in all the commands with "ipv6". Right-click on Command Prompt and click Run as administrator. If prompted click the Allow button. You will see a list of network interfaces. You should replace Local Area Connection with the name that appeared in the “Interface” column from steps 1-3. Restart you computer and then test again. If you still have problems after modifying the MTU repeat the above steps - replacing the numbers 1458 with 1430, or 1380 – restart the computer and test again. First, check to see what IP address(es) your computer has. Go to https://www.whatismyip.com and see what it says. If you only have an IPv4 address, you can't be connecting over IPv6. If you only have an IPv6 address, then you are definitely connecting over IPv6. 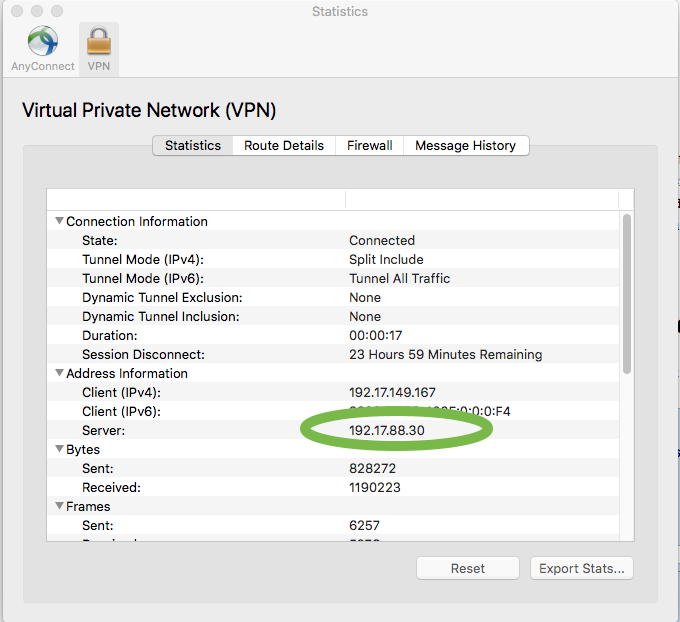 If you have both an IPv4 and an IPv6 address and you aren't able to connect at all, it's hard for you to tell what address you're using to connect with to the VPN. As a general rule of thumb, if you are using the Cisco AnyConnect software it will always use IPv4 if it has one. If you are using openconnect or some other free client, it is likely using IPv6 - most open source software will try IPv6 first. If you absolutely need to know, contact the Technology Services Help Desk, they can look up your connection in the logs and see what IP address you connected with. If you are able to connect, but things aren't working, you can see what the IP address of the server you're connected to is in the VPN application. This will let you know if it is IPv4 or IPv6. Open the statistics window (on Mac click on the graph icon on the connection window, on Windows click on the gear icon on the connection window, then select the statistics tab). Then look for the line named "Server" to find the server's IP address. If the address is in IPv6 format (up to 8 hex numbers, separated by colons - note that there can be fewer than 8 if there is a double colon - such as 2620:0:e00:3a::2) you are connected to the server over IPv6. If the address is in IPv4 notation (4 decimal numbers separated by periods such as 192.17.55.12) you are not connecting over IPv6.